Scientists of the CEMES, in collaboration with scientists of the LSI Ecole Polytechnique, have succeeded in studying the variation of the 3D structure of a magnetic domain wall in nickel nano-cylinders of diameter between 50 and 90 nm. 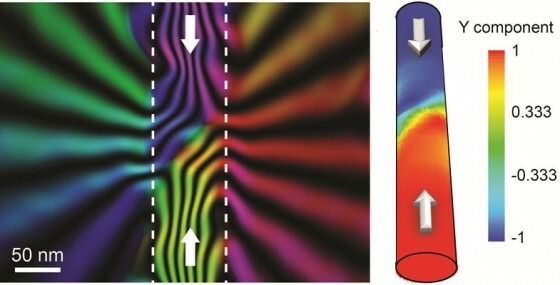 Magnetic phase image in an 85 nm diameter nano-cylinder (left) and magnetic component along the direction of the wire obtained from 3D micromagnetic simulations (right). Magnetic domain walls are transition areas between two domains uniformly magnetized. They can present different geometries (ex : transverse, vortex), depending on the shape of the sample, and can be moved by applying an electrical current or a magnetic field. This last property is used in developing new kind of Spintronics devices such as magnetic memories or logic circuit. However, each kind of domain wall will show different propagation properties (velocity, energy threshold etc..) which is a key point for technological applications. In the past few years, nano-cylinders have attracted much attention since this geometry is predicted to allow for propagating domain walls at higher velocities and lower power consumption than in classical micro and nano electronic device (nanowire, nanostripe). However, no experimental evidence for the shape of the walls in such systems has been given up to now. of the wire, the magnetic remanent state shows a transverse wall for diameter below 60 nm while a complex state, with both vortex and transverse features, arises for diameter above.